Technologically speaking, smaller is virtually always better. 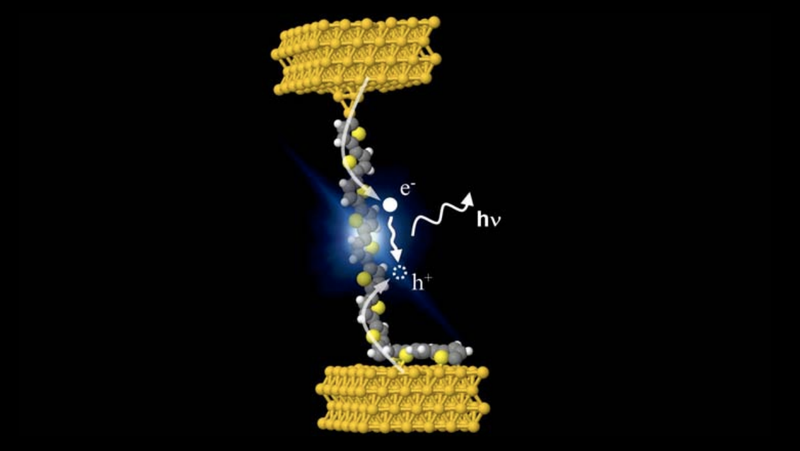 So it's perhaps no surprise that scientists have developed the first ever single-molecule LED. But why is it potentially such a big deal? A team from the Institute of Physics and Chemistry of Materials in Strasbourg, France, has developed the new device. Formed from a single polythiophene wire placed between the tip of a scanning tunneling microscope and a gold surface, it emits light when current passes through it in a certain direction. It's the smallest ever LED to be created, and the results are published in the journal Physical Review Letters. While it's a wildly impressive technical achievement, it's not quite at the stage where it will appear in your hand held devices. A scanning tunneling microscope is, after all, probably about the same size as your refrigerator. So the LED itself isn't quite pocketable yet. But it's the promise of the thing that makes the research a big deal. The humble LED—in all manner of incarnations: organic, quantum, phosphorescent, you name it—lies at the core of modern-day display technologies. They're small right now, sure. That's why you can squeeze 1080p screens—hell, even 4K panels—into a phone display. But we're still talking micrometers in size. A single molecule, in contrast, is better measured in nanometers, a unit just a thousandth of the size. Shrinking the light-emitting element of a pixel by the order of hundreds could, then, make for insane, molecular-scale resolution. While you may be tempted to suggest that 4K screens are ridiculous enough—who needs molecular-level resolution, right?—you'd be jumping the gun. First, the development is set to provide a fundamental stepping stone in our understanding of quantum behavior, allowing scientists to better understand how interactions between electricity and light work at the smallest of scales. But more than that, it will mean that researchers can get to building molecular-sized components—hell, maybe even whole computers—that combine electronic and optical abilities. These won't be devices you actually directly interact with; rather, they'll be sub-units of devices, components which employ quantum effects to make devices you use faster and more efficient. They'll be to modern circuitry what transistors were to valves.